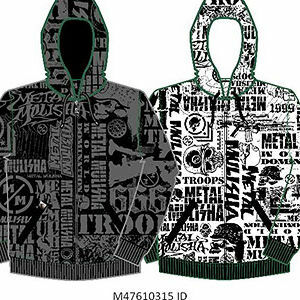 This recall involves about 2,200 boys' hooded fleece sweatshirts that have style number M47610315 and style name "ID" printed along with the RN #120953 located on the country of origin and care label sewn in the center back neck and were sold in sizes S through XL. The sweatshirts were sold in two colors: black and white. Action Sports, Arrow Motorsports, Beaverton Honda Yamaha, Blue Beach Boardshop, California Motorsport Center, Chamber, City Trendz, Cycle Gear, Dead Sailor, Enduro Trgovina in Storitve, For Kids Only/FKO, Fox Racing Inc., Fritz Clothing, Graffiti Skate Shop, Gromitz, Jernigans Inc. DBA Yellow Mart, Loserkids Inc., Metal Mulisha Web Site, Monkeez (Skate & Surf), Novakane, Ocelot Engineering Inc, Ontario Beach Wear Inc. Renton Motorcycles, Riders Outlet, Rooney Inc., SC Rider Supply, Sea Barn, Seidner Enterprises Inc. Skin Retail, Steve's ATV Service Inc., Thorsen Motorsports, Threads Clothing Store, Tillys/World of Jeans & Tops, TJX Companies/Marshalls, Underground Clothing*NSF8/8/07, Valley Skate & Surf, Wicked Wear and Gear, Xtreme Sportsear, and Zappos.com nationwide from August 2007 through November 2007 for about $50. Immediately remove the drawstrings from the sweatshirts to eliminate the hazard, or return the garment to either the store or to MM Compound for a full refund. For more information contact MM Compound toll-free at (877) 685-4742 between 8 a.m. and 5 p.m. PT Monday through Friday.